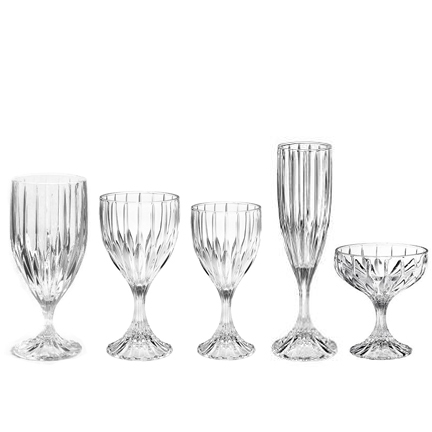 We have crystal water goblets, champagne saucers, champagne flutes, red wine goblets, and white wine goblets. Our crystal collection also includes the matching creamer, sugar, salt and pepper shakers. White Wine Goblets hold 5-7 oz.| Red Wine Goblets hold 6-8 oz. | Champagne Flutes Hold 4-6 oz. | Water Golblets hold 11-13 oz.